A new workweek is upon us. How are you doing? Are you ready for what’s ahead? Have you bought into the pattern that Mondays are supposed to be horrid and a sluggish way to start the week? Are you someone that needs some motivation to get moving that even coffee can’t address? Worse yet, are you filled with dread or anxiety? It is astonishing to me that we have perpetuated the idea that workweeks are destined to start poorly, work to some roller coaster hump mid-week, and then careen blissfully to the release at the end of the week so we can just get away from everything and everyone. Makes you want to wake up and jump to the commute doesn’t it? Pile on top of this that we don’t fill our thoughts going in to work with positive vibes about people either. It’s true. We don’t anticipate seeing smiles and warm welcomes. We expect the worst, and we get it. It reinforces our malaise and we strap our our martyr gear and jump into the fray. Welcome to what HR has become !! But wait . . . .
Why buy into the “norm” ?? 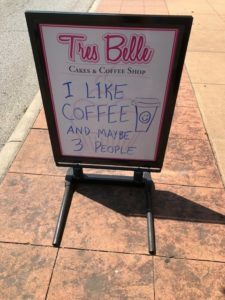 Who is the person or entity that we can hang this on? The answer stares at you in the mirror every morning as you don your work clothes and head out into the midst of your work. You are the reason this attitude and approach exists. It’s not others who cast their nets of darkness on you. They may be doing this, but if you’re defeated before you even enter the office, then you’re already conceding the worst is about to occur. At SHRM16 this year, one of the keynote speakers was Dr. Amy Cuddy from Harvard University. She wrote a spectacular book called Presence which calls for people to bring their “boldest self” to their biggest challenges. Her work shows how that even though we teach fierce independence in our western society, most people are far from bold. She had great research and examples of people who felt open enough to embrace being bold. One of my favorite things she shared was a video of the New Zealand All Blacks rugby team and their pre-game ritual where they get geeked before a match by performing a haka. According to Wikipedia the haka is “traditional war cry, dance or challenge from the Maori people of New Zealand.” When they perform this, they are facing their opponent and they are so animated and intense !! It’s awesome !! 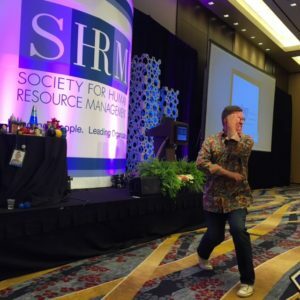 When I gave my presentation, I encouraged all of the folks in HR that we should do a haka every day before we start a thing. Think about it !! It would absolutely freak out your staff and other employees if they heard you getting ready to face the day this way. I showed everyone how mine would look and it felt freeing. Imagine this. Starting your day boldly, intentionally and fiercely !! All of the junk that tends to want to clutter our mind and our efforts blows away and disappears. Also, you’re ready to be proactive and jump into whatever comes your way willingly. It’s overdue my HR friends. People will be bold if we are bold first !! Shake off the Monday blahs and get ready. It’s time for your HR Haka !! Author Steve Browne (Admin)Posted on July 10, 2016 Categories HRTags Approach, Attitude, Difference, employees, HR, HRPositive, Human Resources, SHRM, workplace1 Comment on HR Haka ! !